If you are dissatisfied with the terms, conditions, rules, policies, guidelines or practices of the Torontodarts.com operating website, your sole and exclusive remedy is to discontinue using it. Torontodarts.com may revise this Agreement at any time by updating this posting. Use of the website after such changes are posted will signify your agreement to these revised terms. You should visit this page periodically to review this Agreement. All materials displayed or otherwise accessible through the website, including, without limitation, news articles, text, photographs, images, illustrations, audio clips, video clips, and computer code (collectively, the Content) are protected under Canadian and foreign copyright or other laws, and are owned by Torontodarts.com, its licensors or the party accredited as the provider of the Content. In addition, the website is protected under copyright law as a collective work and/or compilation pursuant to Canadian and foreign laws. You shall abide by all additional copyright notices, information and restrictions on or contained in any of the Content accessed through the website. Any use, reproduction, alteration, modification, public performance or display, uploading or posting onto the internet, transmission, redistribution or other exploitation of the website or of any content, whether in whole or in part, other than expressly set out herein, is prohibited without the express written permission of Torontodarts.com. Torontodarts.com is an official mark or trademark of Torontodarts.com. Other names, words, titles, phrases, logos, designs, graphics, icons and trademarks displayed on the website may constitute registered or unregistered trademarks of Torontodarts.com or third parties. 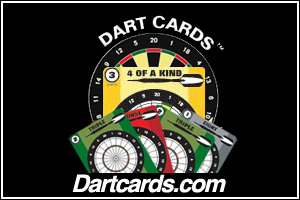 While certain trademarks of third parties may be used by Torontodarts.com under license, the display of third-party trademarks on the website should not be taken to imply any relationship or license between Torontodarts.com and the owner of said trademark or to imply that Torontodarts.com endorses the wares, services or business of the owner of said trademark. Nothing contained on the website should be construed as granting you any license or right to use any trademark logo or design of Torontodarts.com or any third party, without the written permission of Torontodarts.com or the respective owner of any third-party trademark. Subject to applicable law, in no event shall Torontodarts.com, its officers, directors, employees, agents, licensors or their respective successors and assigns, be liable for any special, indirect, incidental or consequential damages of any kind, including, without limitation, any loss or damages in the nature of or relating to lost business, lost savings, lost data and/or lost profits, regardless of the cause and whether arising in contract (including fundamental breach), tort (including negligence) or otherwise. The foregoing limitation shall apply even if Torontodarts.com knew or ought to have known of the possibility of such damages. In no event shall Torontodarts.com, its officers, directors, employees, agents, licensors or their respective successors and assigns, be liable for any loss or damage arising from the failure of Torontodarts.com or your failure to protect your password or acocunt information. Torontodarts.com expressly disclaims any and all liability for the acts, omissions or conduct of any third-party user of the website or any advertiser or sponsore of the website (collectively, third-party user). Under no circumstances shall Torontodarts.com and its officers, directors, employees, agents, licensors or their respective successors and assigns, be liable for any injury, loss, damage (including special, indirect, incidental or consequential damages) or expense arising in any manner whatsoever from (i) the acts, omissions or conduct of any third-party user; and (ii) any use or inability to use any materials, content, goods or services located at or made available at any website linked to or from the website. You hereby release Torontodarts.com and its officers, directors, employees, agents and their respective successors and assigns, from any damages that you incur, and agree not to assert any claims against them, arising from your purchase or use of any products or services made available through the website or by third parties through the website. contains, posts or transmits any information, software or other material which violates or infringes upon the rights of others, including material which is an invasion of privacy or publicity rights, or which is protected by copyright, trademark or other proprietary rights. Torontodarts.com reserves the right to prohibit or refuse to accept any link to the website, including, without limitation, any link which contains or makes available any content or information of the foregoing nature, at any time. 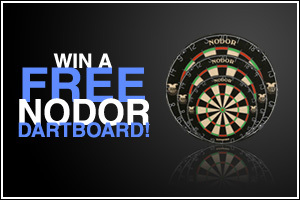 You agree to remove any link you may have to the website upon the request of Torontodarts.com. Torontodarts.com is not responsible for the content of any Submission. Submissions represent the views and opinions of the person(s) posting the Submission and do not represent the views or opinions of Torontodarts.com. You should be aware that when you share personal information in public areas of our web sites, such as chat rooms, discussion groups or bulletin boards, this information might be seen and used by others. We urge you to use good judgment when sharing yours or others personal information in these forums. We reserve the right to use all e-mail addresses submitted in contest entries or by any other means in our various e-mails, including but not limited to: event reminder messages, newsletters, special offers and promotions. While Torontodarts.com is under no obligation to investigate any complaint regarding any Submission, it may, in its sole discretion, investigate complaints and take any actions it deems appropriate in the circumstances, including, without limitation, removing the offending communication from the website and terminating the submitting party's right to access and use the website (or any portion thereof). To use certain features of the website, you may also need a username and password, which you will receive through the Website registration process. You are responsible for maintaining the confidentiality of the password and account, and are responsible for all activities that occur under your password or account. You agree to notify Torontodarts.com immediately of any unauthorized use of your password or account or any other breach of security, and to ensure that you exit from your account at the end of each session. Torontodarts.com cannot and will not be liable for any loss or damage arising from Torontodarts.com's failure or your failure to protect your password or account information. Please note that information sent or received over the Internet is generally unsecure and Torontodarts.com cannot and does not make any representation or warranty concerning security of any communication to or from the website or any representation or warranty regarding the interception by third parties of personal or other information. Torontodarts.com may at any time, without notice, in its sole discretion and without cause, terminate your right to access or use the website, (or any portion thereof). Torontodarts.com may also terminate your right to access and use the website, or any part of the website, if you breach any term or condition of this Agreement. The website (excluding linked websites) is controlled by Torontodarts.com from its offices within the Province of Ontario, Canada. By accessing or using the website, you agree that all matters relating to your access to, or use of, the website and/or the Content shall be governed by the laws of the Province of Ontario and the laws of Canada, without regard to the conflict of laws principles thereof. You agree and hereby submit to the non-exclusive jurisdiction of the Federal Court of Canada and/or the courts of the Province of Ontario with respect to such matters. You agree that the provisions of the United Nations Convention on Contracts for the International Sale of Goods shall not apply. Any consent by Torontodarts.com to, or waiver of, a breach of this Agreement which you have committed, whether express or implied, shall not constitute a consent to, or waiver of, any other, different or subsequent breach. You may not assign or transfer this Agreement or any right or obligation hereunder. If any term or provision of this Agreement is held by a court of competent jurisdiction to be invalid, it shall be severed and the remaining provisions shall remain in full force without being invalidated in any way. This Agreement is not intended to create a partnership, joint venture, or agency relationship between the parties. Except for any agreements with Torontodarts.com that expressly reference this Agreement, this is the entire agreement between you and Torontodarts.com relating to the matters contained herein.